◕‿◕ SAFETY CERTIFICATION - The GYBBER&MUMU wooden toys are rigorously tested for safety by international laboratory. Approved ASTM & CPSIA test. Lead-Free & BPA- Free & Phthalates Free. The edges are smooth and won't hurt the baby's delicate skin. ◕‿◕ PRODUCT DETAILS - 1 board and 9 wood toy with different color(such as red, yellow, pink, etc) and geometric shapes (such as circle, square, rectangle, triangle, etc.). Product size: 7.87 x7.87 x 0.4 in. ◕‿◕ VARIOUS COLOR AND SHAPES - These wood are made up of geometric figures with different colors. 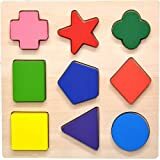 Not only let the child know all kinds of colors, but also let the child have a preliminary understanding of geometric figures. Enrich the baby's knowledge, and analyze the different roles of different geometric shapes in real life. ◕‿◕ BABY EARLY SKILLS ACQUISITION - Strengthens fine motor skills, visual-spatial skills; Inspires creativity, imaginative play. Encouraging babies' hands, eyes, brain coordination, promoting color recognition and fine motor skills, so as to inspire children's imagination. ◕‿◕ PREFECT GIFT - We know how much you cherish the time spent with your children, but sometimes the busy life of a parent doesn't always allow much opportunities. If you want to make sure kids is occupied while doing something fun, productive and safe, this toy is perfect for you. Nice gift set or staple for every classroom, daycare, preschool, home & anywhere else. Perfect choice for many happy moments.